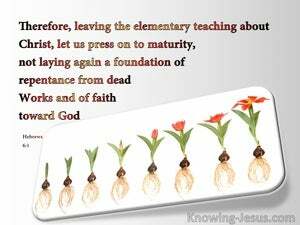 1 Therefore leaving the principles of the doctrine of Christ, let us go on to perfection; not laying again the foundation of repentance from dead works, 2 and of faith in God, Of the doctrine of baptisms and laying on of hands, and the resurrection of the dead, and eternal judgment. And saying, Repent ye; for the kingdom of heaven is at hand. Therefore ye shall be perfect, as your Father who is in heaven is perfect. and the floods came, and the winds blew, and beat on that house; and it fell not; for it was founded on a rock. He answering said, I will not; but afterward repenting, he went. For John came to you in the way of righteousness, and ye believed him not; but the publicans and the harlots believed him. And ye seeing it, repented not afterward, that ye might believe him. And they went out and preached, that men should repent. He is like a man, who built an house, and digged deep, and laid the foundation on a rock: and when the flood arose, the stream broke vehemently upon that house, but could not shake it; for it was founded on a rock. In the beginning existed the Word, and the Word was with God, and the Word was God. Jesus said with a loud voice, He that believeth on me, believeth not on me, but on him that sent me. And Peter said, Repent, and be baptized every one of you, in the name of Jesus, for the remission of sins, and ye shall receive the gift of the Holy Ghost. When they heard these things, they were quiet, and glorified God, saying, Then God hath given to the Gentiles also repentance unto life. The times of ignorance indeed God overlooked; but he now commandeth all men every where to repent. Testifying both to Jews and Greeks repentance towards God and faith in our Lord Jesus Christ. But first to them at Damascus and at Jerusalem, and through all the country of Judea, and then to the Gentiles I declare, that they should repent and turn to God, doing works worthy of repentance. And when that which is perfect is come, then that which is in part shall vanish away. Having therefore, beloved, these promises, let us cleanse ourselves from all pollution of the flesh and of the spirit, perfecting holiness in the fear of God. Not that I have already attained, or am already perfected: but I pursue, if I may apprehend that, for which I was also apprehended by Christ Jesus. Whom we preach, admonishing every man, and teaching every man, that we may present every man perfect through Christ Jesus. Epaphras, who is one of you, a servant of Christ, saluteth you, always labouring fervently for you in prayer, that ye may stand, perfect and filled, with all the will of God. The mystery of godliness is the pillar and ground of the truth, and without controversy a great thing: God was manifested in the flesh, was justified by the spirit, seen by angels, preached among the Gentiles, believed on in the world, taken up into glory. 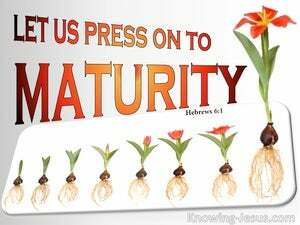 Treasuring up for themselves a good foundation against the time to come, that they may lay hold on eternal life. But the foundation of God standeth fast, having this seal, The Lord knoweth those that are his: and, Let every one who nameth the name of the Lord depart from iniquity. For when for the time ye ought to be teachers, ye have need that one teach you again, which are the first principles of the oracles of God, and are become such as have need of milk and not of strong meat. But without faith it is impossible to please him; for he that cometh to God, must believe that he is, and that he is a rewarder of them that diligently seek him. that ye may be perfect and intire, wanting nothing. Who thro' him believe in God, that raised him from the dead, and gave him glory, that your faith and hope, might be in God. No man hath seen God at any time. If we love one another, God abideth in us, and his love is perfected in us. He that believeth on the Son of God, hath the testimony in himself. He that believeth not God, hath made him a liar, because he believeth not the testimony which he hath testified of his Son.